Colaborate with others, analyze your code, take a full advantage of cloud architecture, and take full control of your projects by letting Cloud9 to maintain smaller and automated jobs. Simply pick your configuration and develop your app. No need to spend valuable development time on system setup and maintenance. You can create, build and run any development stack in seconds. We maintain it, you control it. Workspaces are powered by Docker Ubuntu containers that give you full freedom over your environment, including sudo rights. Do a git push, compile SASS, see server output, and Run apps easily with the built-in Terminal and Runners. Do more than just copy and paste your code. 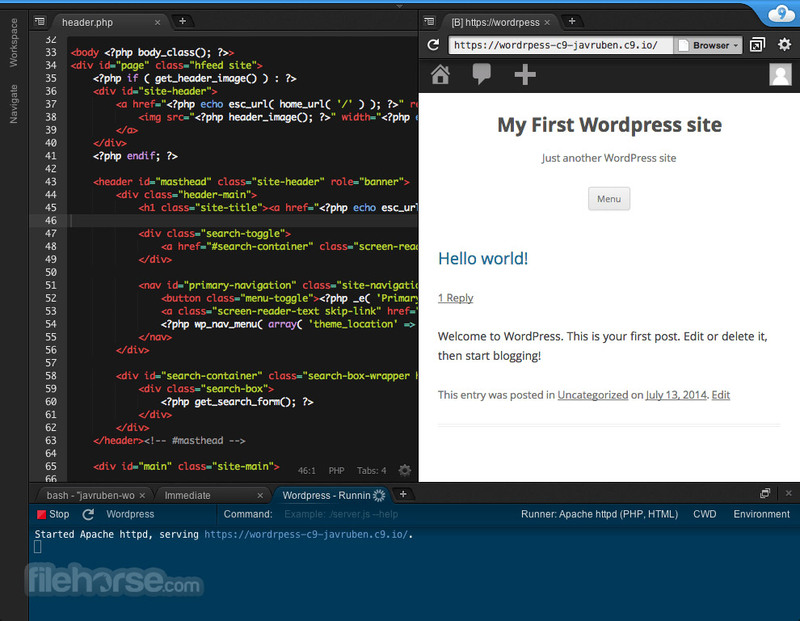 With workspace cloning, you make a full copy of your code, environment setup, and tab layout. Duplicating your development environment is as easy as clicking a button. Code Completion suggestions appear as you type to help you code faster and avoid typos. Use the Outline view to better understand your code, and Jump to Definition of variables for easy navigation. Debug your code! 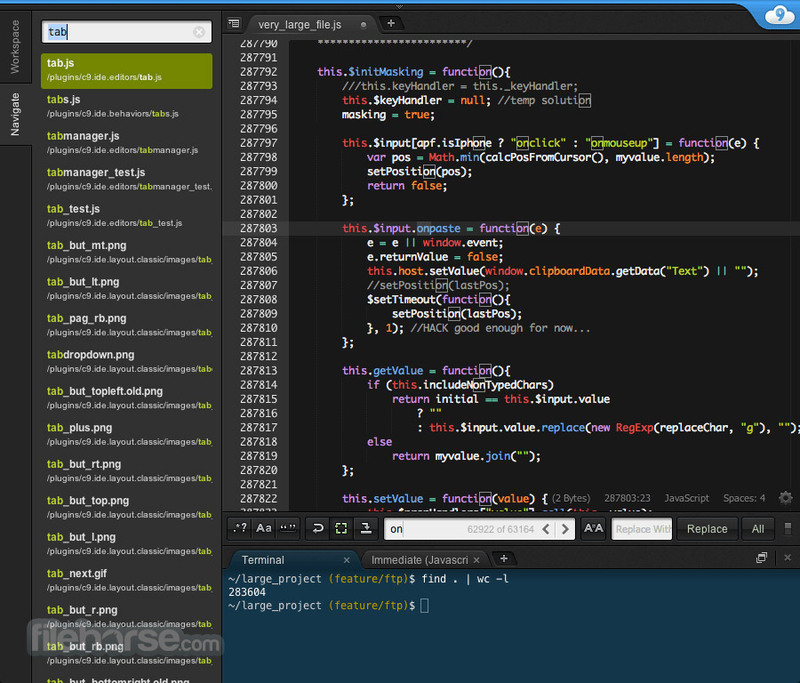 Simply drag any file or Terminal tab around to create as many split views as you like, in any direction. In fact, every part of the UI can be enabled/disabled to your liking. 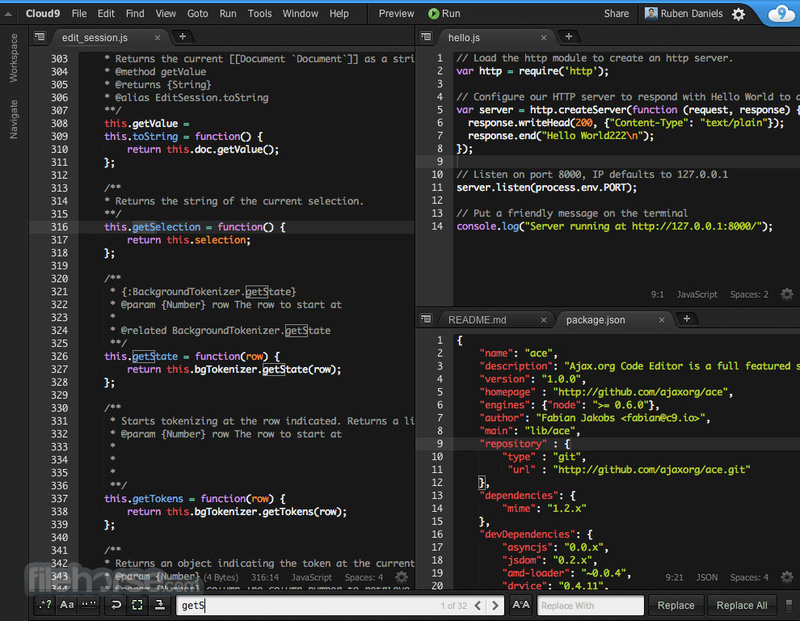 Choose from 30+ themes and color schemes that control syntax highlighting and the UI. You can also custom style Cloud9 by editing your stylesheet. Choose from an extensive set of default Runners to execute your app, such as Ruby, Python, PHP/Apache, CoffeeScript, or Node.js. Or run any command in a Run config, including environment variables. All keyboard commands can be fully configured, so you don't have to learn a new set of keystrokes. Or simply import a keymap file from a friend. It's like you never switched tools. Used to VIM, Emacs, or Sublime? Simply configure Cloud9 to go into one of these modes to get the best of both worlds. Why interrupt your web development flow to edit an image on your machine? Cloud9 also sports an image editor. Resize, crop, rotate, or flip - straight from the browser. Experience the awesome productivity of coding together - no matter where you are. 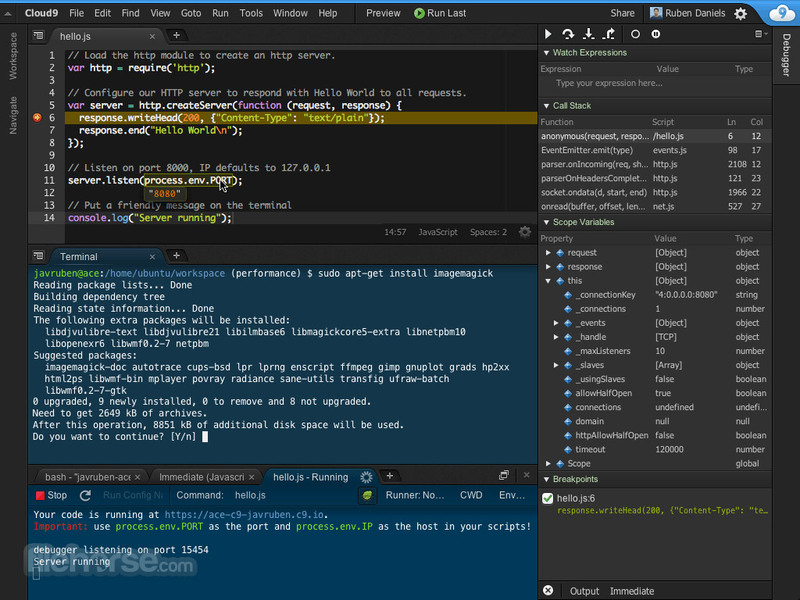 Cloud9 IDE now enables developers around the world to edit the same code and chat together in real-time. Developers can pair program, review code, get an audience involved or teach a group of students the art of programming. The way you code together will never be the same again. Debug your code! Professionals: welcome to the Cloud9 revolution. With Cloud9 securely attached to a dedicated VM, professional developers and teams experience the full power of development in the cloud. Run the entire breadth of server software on the command-line, from Python to MySQL and everything in between.